Pharmacovigilance started about 170 years ago, although it was not yet named as such at that time. It is structured activity in the professional health field, with important social and commercial implications aimed at monitoring the risk/benefit ratio of drugs, improving patient’s safety and the quality of life. 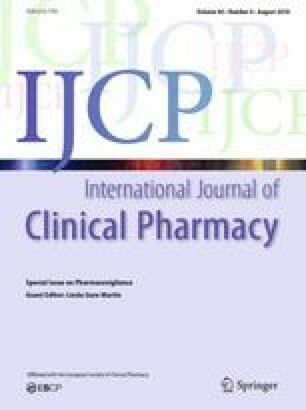 In this commentary we report the milestones of pharmacovigilance up to the present day, in order to understand all the steps that have characterized the historical evolution; from the first reports, which were essentially letters or warnings sent by clinicians to publishers of important and famous scientific journals, up to today’s modern and ultra-structured electronic registries. The historical phases also help us to understand why pharmacovigilance helped us to achieve such important results for man’s health and for pharmacology itself, and to identify the challenges that await Pharmacovigilance in future years. Pharmacovigilance (PV) is defined by the European Commission (EU) as the “Process and science of monitoring the safety of medicines and taking action to reduce the risks and increase the benefits of medicines”. The international PV systems aim to monitor the risk/benefit ratio of drugs as well as improve patients’ safety and their quality of life. PV activities include: collecting and managing data on the safety of medicines, looking at individual case reports to detect new “signals”, pro-active risk management to minimize any potential risk associated with the use of medicines, communicating and informing stakeholders and patients. This seamless post-marketing surveillance, which is primarily aimed at protecting the public, allows CAs (Controlling Authorities) to modify—on the basis of newly discovered signals—the Summary Product Characteristics (SPC), released by the Marketing Authorization Holder (MAH) for any new medicinal product at the first boot into the market . The etymological roots for the word “pharmacovigilance” are: Pharmakon (Greek) = medicinal substance, and Vigilia (Latin) = to keep watch. In this short article, we describe the milestones (as represented in Fig. 1) that led to the evolution of Pharmacovigilance activities in the last century. We intentionally excluded a part of scandals (e.g. inhibitors of cyclooxygenase types 2 because of cardiovascular adverse reactions), because they were mainly due to incorrect marketing or inappropriate information campaigns by pharmaceutical companies . The history of Pharmacovigilance started 169 years ago, on Jan 29, 1848, when a young girl (Hannah Greener) from the north of England died after receiving chloroform anesthetic before removal of an infected toenail. Sir James Simpson had discovered that chloroform was a safer and powerful anesthetic, and he had introduced it in clinical practice. The causes of Hannah’s death was investigated to understand what happened to Hannah, but it was impossible to identify what killed her. Probably she died of a lethal arrhythmia or pulmonary aspiration . As a result of other deaths and alerts raised by the clinicians and the public about the safety of anesthesia, The Lancet Journal established a commission to take on this problem. The commission exhorted English doctors, including the doctor in colonies, to report deaths caused by the anesthesia. The results were published in The Lancet in 1893 . The US Federal Food and Drug Act was formed on June 30, 1906, and it established that drugs must be pure and free of any contamination. Furthermore, in 1911, this organization forbade false therapeutic indications of drugs . In 1937, there were 107 deaths in the USA, because of the use of sulfanilamide elixir, containing diethyl glycol as the solvent. This solvent was considered the cause of deaths, but the manufactory companies were not aware about its toxicity at that time [3, 5, 6]. Consequently, the Federal Food, Drug and Cosmetic Act was established in 1938; its aim was to renovate the public health system. Indeed, the new system foresaw that the safety of drugs should be demonstrated before their market approval, and introduced the possibility of conducting factory inspections . In 1938, Douthwaite supposed that acetylsalicylic acid (ASA) could cause melena . The study of the gastrointestinal toxicity of ASA showed different outcomes. However, in 1955, it was proved that ASA can cause gastrointestinal diseases and therefore it is currently contraindicated in patients with gastrointestinal ulcers . Establishment within the EMA of the Pharmacovigilance Risk Assessment Committee (PRAC). In particular, the most relevant change consists in the new definition of ADR: “A response to a medicinal product which is noxious and unintended”. In fact, with this definition were covering any adverse event following the use of a medicine, also medication errors and uses outside the terms of the marketing authorization, including the misuse and abuse of the medicinal product. Furthermore, the new legislation set-up measures to facilitate the performance of PV, called the Good Pharmacovigilance Practices (GVP). The guideline on GVP is divided into two categories: modules covering major Pharmacovigilance processes and product- or population-specific considerations. This last category is available for vaccines and biological medicinal products. In this guideline there are also special chapters dedicated to special areas, namely pregnancy and breast-feeding (P III) and geriatric population (P V) . In November 2017, the new EudraVigilance format was launched; in particular, the marketing authorizations will have extended access to the EudraVigilance database to support the fulfillment of their Pharmacovigilance obligations. These obligations include the continuous monitoring of EudraVigilance data and the communication of validated signals to the Agency and national regulatory authorities, as outlined in Commission Implementing Regulation (EU) N. 520/20121 . 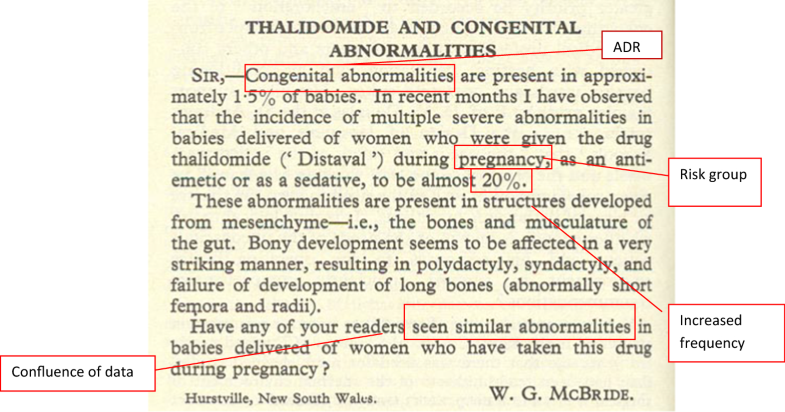 The authors thank the Editor of The Lancet Journal for permission to use McBride’s letter (1961) to explain the basic elements of Pharmacovigilance. This study was funded by Agenzia Italiana del Farmaco (AIFA) and Regione Autonoma Friuli Venezia-Giulia (Number: H25E11000000005). Pharmacovigilance Risk Assessment Committee: PRAC strategy on measuring the impact of Pharmacovigilance activities. 2016. http://www.ema.europa.eu/docs/en_GB/document_library/Other/2016/01/WC500199756.pdf. FDA Consumer Magzine. https://www.fda.gov/downloads/AboutFDA/WhatWeDo/History/Origin/ucm125604.doc (1981). Accessed 22 Dec 2017. Food and Drug Administration (FDA). History. https://www.fda.gov/AboutFDA/WhatWeDo/History/. Accessed 22 Dec 2017. ICH guideline. https://www.ich.org/fileadmin/Public_Web_Site/ICH_Products/Guidelines/Efficacy/E2D/Step4/E2D_Guideline.pdf. Accessed 22 Dec 2017. YellowCard. https://yellowcard.mhra.gov.uk/monitoringsafety/. Accessed 22 Dec 2017. Council Directive 65/65/EEC. http://www.echamp.eu/eu-legislation-and-regulation-documents/directive_65-65-eec__-__consolidated_version.pdf. Accessed 22 Dec 2017. Boston Collaborative Drug Surveillance Program. http://www.bu.edu/bcdsp/. Accessed 22 Dec 2017.
WHO Pharmacovigilance. http://www.who.int/medicines/areas/quality_safety/safety_efficacy/pharmvigi/en/. Accessed 22 Dec 2017. ISoP - ESOP/ISoP History. http://isoponline.org/about-isop/esopisop-history/. Accessed 22 Dec 2017. EMA History. http://www.ema.europa.eu/ema/index.jsp?curl=pages/about_us/general/general_content_000628.jsp. Accessed 22 Dec 2017. EudraVigilance history. http://www.ema.europa.eu/ema/index.jsp?curl=pages/regulation/general/general_content_000633.jsp. Accessed 22 Dec 2017. Directive 2010/84/EU. https://ec.europa.eu/health/sites/health/files/files/eudralex/vol-1/dir_2010_84/dir_2010_84_en.pdf. Accessed 22 Dec 2017. EMA Pharmacovigilance. http://www.ema.europa.eu/ema/index.jsp?curl=pages/regulation/general/general_content_001819.jsp&mid=WC0b01ac05800241de. Accessed 14 Mar 2018.